Shockwave in the political arena. 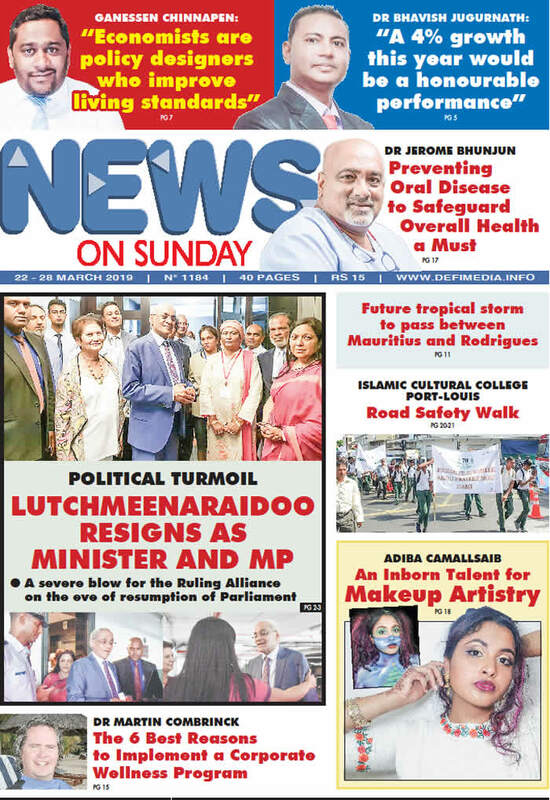 On Thursday, Vishnu Lutchmeenaraidoo took everyone by surprise by submitting his resignation as Minister of Foreign Affairs and as a Member of Parliament. This comes after the controversy he raised last week about the rate of growth that has stagnated at 3% for years. “Enough is enough,” he told the press to justify his resignation. Ganessen Chinnapen, Economist by profession specialises in macroeconomic development. He has 10 years of professional experience in UK, Mauritius and across Africa. He is an alumni and a visiting researcher at the University of Manchester, UK and has been writing a lot on the shift of economic power and leadership from west to east. Ganessen is also an economic consultant for DFID and Plan International. He agrees to share his views with News on Sunday on various issues. Poor oral health and oral diseases affect people irrespective of their age. Prevention of the prevalence of oral diseases can, however, be done by raising awareness and by early detection and treatment, among others. In line with the World Oral Health Day celebrated on 20th March, Dr Jerome Bhunjun, who has 20 years of experience as principal dental surgeon, talks to us about the common oral diseases among Mauritians, why it is vital for people to make oral health a priority and also provides some details about his professional pathway. According to the Mauritius Meteorological Services, the low pressure area evolving in the north east of Mauritius could intensify into a tropical depression. “The low pressure area has intensified since Wednesday night. If environmental conditions remain optimal for its development and it further intensifies by Friday, it will eventually become a tropical storm and will be named Joaninha. According to our analysis, the future storm could pass between Mauritius and Rodrigues. However, its trajectory could also change at the last minute,” explained the Mauritius Meteorological Services. The number of road accidents and road victims continue to escalate in Mauritius. The Islamic Cultural College, on the occasion of its 70th anniversary, decided to organize a road safety walk to increase the awareness of the public and its students about road safety. Hundreds of students marched shoulder to shoulder with the trailblazers of Road Safety on the streets of Plaine Verte in the morning of Wednesday 20th March, accompanied by members of the Police Force. Her artistic skills have led her to transform herself into a talented makeup artist. Fond of art since her young age, Adiba Camallsaib, aged 20, is known for her mesmerizing makeup designs on social media. A student at the University of Mauritius, majoring in Politics, Human Rights and International Relations, the gifted artist shares with us how her innate talent as an artist has emerged. Corporate Wellness programs are gaining popularity worldwide. Wellness programs are common among different sized businesses. When done correctly, wellness programs give employees incentives, tools, social support, privacy, and strategies to adopt and maintain healthy behaviour. Dr Martin Combrinck, CEO of Sanga Wellness in South Africa, shares with News on Sunday the main features of his wellness program, a concept he will soon introduce in Mauritius. 19 avril 2019 [Dossier] Lumière bleue : un vrai danger pour les yeux ?